Children* train free when accompanied by a training parent during Saturday morning classes. That’s £5 for both parent and child! Please note, that if the parent doesn’t attend training then the child will pay the standard £5 training fee. 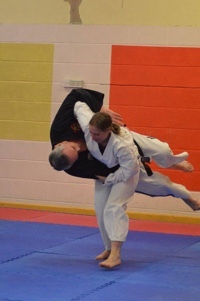 Get Fit & Keep Fit – Build Self Confidence & Learn to Defend Yourself with JuJitsu. Our clubs offer training at all levels in a friendly atmosphere for juniors & seniors including family training on Saturday mornings. 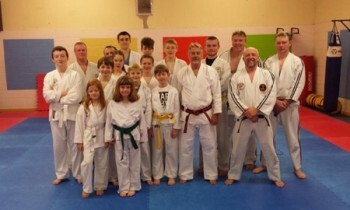 The original Skipton JuJitsu club was formed in the early 1970s by Sensei Robert Ashworth and was affiliated to the British JuJitsu Association. Over the years Sensei Ashworth opened jujitsu Clubs throughout Yorkshire and Lancashire eventually forming his own organisation RA Defence. He continued his own training throughout this time to reach the standard of 8th Dan. 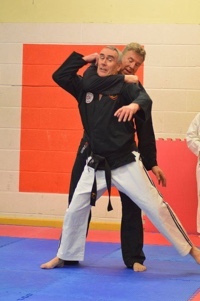 On his retirement from instructing in 2005 the Skipton and Preston JuJitsu Clubs continued under the leadership of Senseis Craig Barson (6th Dan) Mel Seward (6th Dan) and Phil Harrison (5th Dan) under the name of “Rose Counties JuJitsu“. The clubs offer training in a friendly atmosphere for all levels of ability and fitness from age 7 upwards. Now affiliated to the Cobra Martial Arts Association our instructors are trained and qualified to the requirements of the Martial Arts Standards Agency, hold the appropriate First Aid qualifications and are checked through the Government Disclosure & Barring Service. Rose Counties JuJitsu operates an equal opportunities policy. Membership is £20 for the first year then £15 per year thereafter. Membership includes 3rd party insurance. 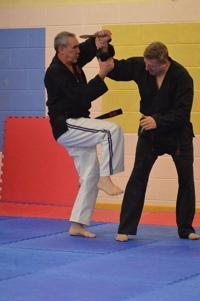 The Club is authorised by Cobra Martial Arts Association to use its progressive grading system where it is considered appropriate for coloured belt (KYU) grades. This is to ensure members who are not in a position to take a formal grading are not treated unfairly. It allows each syllabus requirement to be assessed individually over a period of time. The standards required to pass each syllabus requirement are high. More specific details of the system can be provided upon request. Well done Aiden. Well deserved. Many congratulations to Tony Dewhurst our most senior instructor at Rose Counties Jujitsu on recently being awarded his 6th dan. It takes many years of dedication to gain such an award and is well deserved. awesome Tony well deserved ! Only just spotted this. Well done Tony. Beginners are welcome to all classes. Your first lesson is free!